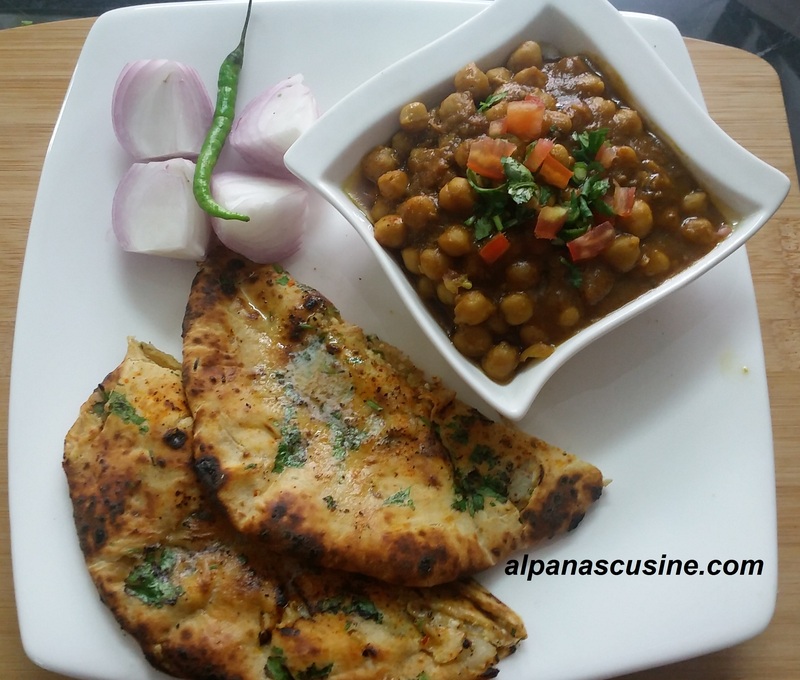 Amritsari Aloo Paneer Kulcha is traditional North Indian dish , I had prepared first time in my kitchen and I am very excited to share because of its easy preparation of such a delicious Bread .Kulcha is a traditional punjabi recipe and city of Punjab is famous for its kulcha.Traditionally kulcha make in a clay tandoor or baked in an earthern clay oven . But here I have prepared on Gas stove. Method for chole- First soaked the Chole overnight in water.In a pressure cooker add the chole along with anardana powder and salt. and boiled in Pressure cooker around 20 minutes in low flame. Heat the pan and dry roast coriander,cumin seeds,black pepper and garam masala.After cool down the roasted masala make a fine powder.Heat the oil in a pan ,add chopped onion and ginger saute for 5 minutes then add tomatoes and saute then add roasted spice powder ,mix well. Add boiled chole mix well with masala and cook for another 5/7 minutes. Preparation of stuffing -In a bowl take mashed potatoes,grated paneer,red chilli powder,dry mango powder,salt,chopped green chillies,chaat masala and coriander leaves ,mix well.divide the mixture into 5 portion. Method for Kulcha dough– In flour mix salt ,sugar,baking powder,baking soda and sift the flour two times.Then add oil,yogurt and milk ,mix well.Now add water little by little at a time to knead a soft dough.Then take little oil and rub over the dough.Cover the dough with damp cloth for 3 to 4 hours.After 4 hours,knead the dough again and make 5 round balls of dough. Take a dough ball and roll it gently by dusting a little dry flour about 3/4 inch diameter.Place 1 portion of potato paneer mixture in the center.Now close the sides together.Then stick some chopped coriander on the top side of the stuffed ball. Heat the tawa on the gas stove.Rub the wet hand or sprinkle little water on the one side one side of the kulcha and stick the kulcha on the tawa,keep it on low flame for 3/4 minutes.After that turn the tawa upside down over the direct flame till kulcha become golden brown.Gently take out the kulcha from tawa.